During his systematic two-round beating of Dennis Siver, Conor McGregor didn’t deliver on his promise of ending the fight within two minutes, but he still sent an emphatic message to UFC featherweight champion Jose Aldo. Immediately following the stoppage McGregor rushed to hurdle the cage to get in Aldo’s face. 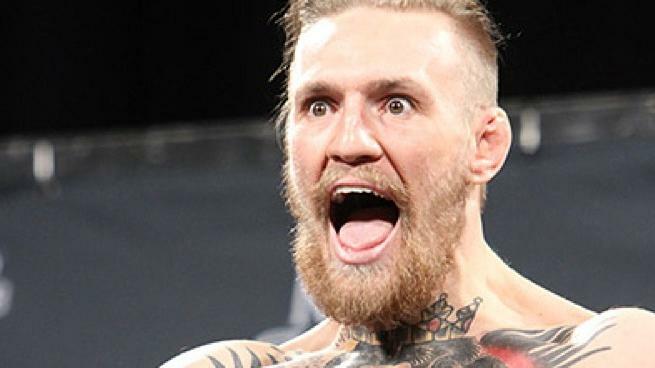 He stretched his undefeated streak in the UFC to five (13 overall) and will be handed a UFC featherweight title shot against the Brazilian, who greeted the screaming McGregor with a wry smile. Whether it takes place in Dublin or Las Vegas, it’s one serious title fight to look forward to later in the year. After the bold statements and trash-talking, anything but a first round victory may have been labelled a disappointment. Although falling short of his prediction, the way the Irishman took Siver apart meant fans in the TP Garden in Boston didn’t want it to end, such was the excitement of the one-sided victory. Before the fight, as both fighters squared off, Siver refused to touch gloves and received a middle-finger in return. That was about as authoritative as the Russian was all night as from then on McGregor dominated. Stalking his opponent across the Octagon, Siver had nowhere to hide and was unable to deal with the range of his opponent. The number 10 ranked fighter was left battered and bloodied at the end of the first round as a series of straight left jabs did the damage, ‘The Notorious One’ demonstrating his full arsenal of skills by mixing it up with some lightning head-kicks. The finish came in the second round when one of those straight left-hands finally sent Siver to the ground. 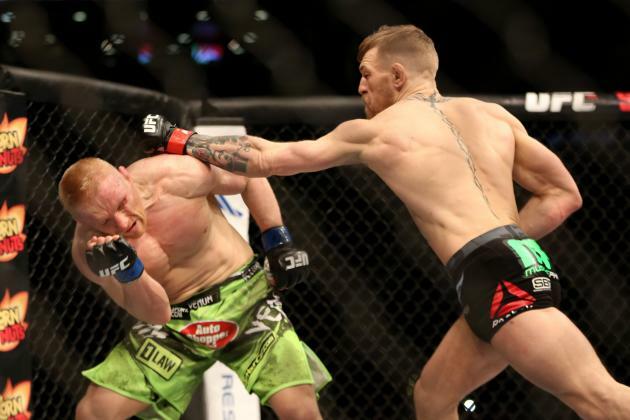 McGregor was calm in taking full mount, and then forced the referee to stop the fight as Siver covered up. Calmness personified. Never letting himself get impatient during the bout, McGregor was always in control and when he sensed the stoppage was near, he took his time to gain position and then finished the job. Following up his beating of Dustin Poirier, putting Dennis Siver away without even appearing to break sweat shows that maybe Conor McGregor has the skills to back up his continuous barrage of taunts and promises. Aldo says he’s not convinced, but you can bet your bottom dollar he won’t be talking McGregor lightly. In the co-main event Donald ‘Cowboy’ Cerrone earned what looked a fortunate decision victory over his friend Benson Henderson. Having beaten Myles Jury 15 days ago at UFC 182, Cerrone avenged two previous defeats to Henderson in a closely-contested lightweight match-up. Taking his winning streak to seven, the unanimous scorecard decision means Henderson has lost two consecutive fights for the first time in his career. Uriah Hall also tasted victory in Boston. After a deep cut under Ron Stalling’s eye forced the referee to end the middleweight bout, Hall took his winning run to three. Stallings was making his UFC debut and took the fight on short notice when both Costas Philippou and Louis Taylor withdrew through injury. McGregor’s fellow Irishman Norman Parke, unbeaten in five UFC fights, lost a split-decision to veteran Gleison Tibau in the first fight on the main card.